This lovely, upstanding International Grand Prix stallion by Rubinstein has now retired from competitive dressage and we are extremely fortunate to have him standing at stud in the UK. In competition his marks averaged between 65 – 76%. His wins at Grand Prix included the Hamburg Derby in 2008 and Leipzig in 2009. After the Derby when the best 3 riders change horses for a short Grand Prix his owner and rider Heike Kemmer said of Rudi “his willingness to work and his willingness to participate are always priceless”. He also qualified for the World Cup finals. His sire Rubinstein is considered by many to be “the stallion of the century”. 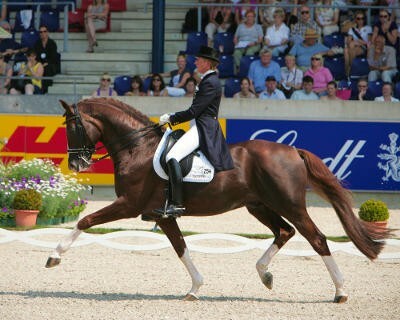 An accomplished dressage performer he has 40 wins at GP, was a member of the 1996 Olympic team, 89 state premium mares and 66 approved stallions including Rodhiamant and Rotspon. Royal Rubin’s dam line is associated with jumping. His dam Barbarella is by the Oldenburg Brandenburger, a puissance specialist by the KWPN jumping stallion Beach Boy, the dam sire of Olympic stallion Arko lll. 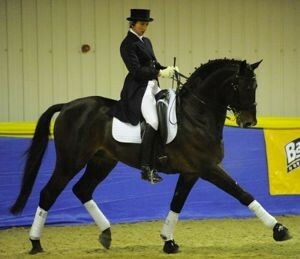 Grading: 70 day performance tested Brandenburg/Anhalt Studbook, WBS-UK, BHHS, Oldenburgh.